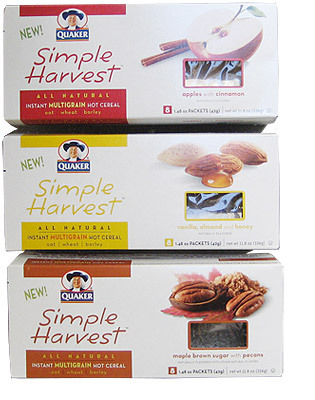 Bravo to Quaker's Simple Harvest Instant Multigrain Hot Cereal! They've infused the often-considered-boring hot cereal sector with some much needed excitement. You first suspect that in you're in for something special when you see the the box. It's sleek and colorful and a transparent window in the front reveals the healthy contents of a clear packet inside. Fortunately for us, what you expect is pretty much what you get. With more grains and bits of real fruit and nuts, your mouth is in for more of an adventure than you get from standard oatmeal. Each spoonful offers a variety of textures and tastes. Of the three varieties, I liked Maple Brown Sugar With Pecans the best. It's infused with the same warm maple flavor we know from maple and brown sugar oatmeal, but with bites of a pecans in every bite and a straight-from-the-field texture, this cereal feels like oatmeal deluxe... like an improvement on something we already love. The Apples With Cinnamon variety is the most flavorful of the three. The apple pie smell you get when you add water is ever-present in the taste. My only complaint is that this cereal might be better with smaller dried apple pieces or none at all. Compared to the rest of the cereal, the apple pieces are slippery and firm, a distraction from what is otherwise nearly-perfect. 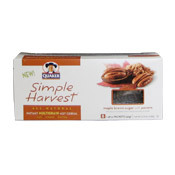 My least favorite was Vanilla Almond And Honey Simple Harvest. 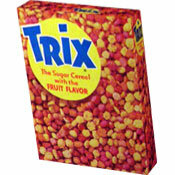 Compared to the other varieties, this was the only cereal that had somewhat of an artificial flavor. You might not notice it if you were pitting this cereal against most oatmeals, but since the other Simple Harvest cereals taste so completely natural, anything that feels artificial is immediately noticeable. That said, this cereal is still worth a try if only for the slivers of almonds you get in every bite. The truth is that these new cereals have little more health value than oatmeal. Oatmeal offers 3 grams of fiber per serving. These cereal have 4. Both contain 4 grams of protein. In fact, most instant oatmeal varieties have more vitamins since they are commonly fortified. But readers of MrBreakfast.com know that oatmeal is a miracle food. Any cereal with a nutritional profile in the same ball park as oatmeal is an instant winner. The reason I'm excited about this cereal line isn't because it's healthier or tastier. I'm excited because it might draw people's attentions toward the oatmeal section of the cereal isle. The importance of whole-grains to our diet is irrefutable. Whether it's simply oats or a combination of whole grains, you're doing your body a great favor by having this type of cereal a couple times a week. Quaker just made it a little easier to get excited about healthy eating. I hope you'll give it a try. One final note: Look for this product on sale. Given the difference in price, between these and a similar-sized boxes of instant oatmeal. The cost-per-health-benefit ratio currently favors instant oatmeal, ie. right now this product is way overpriced. What do you think of Simple Harvest Multigrain Hot Cereal? The maple version was awesome. Too bad you can't find it anymore. Shoot. I cannot find it anymore. Cannot find Simply Harvest any where in stores now. I have found it at my local Big Lots Stores!!! Great product... especially the apples and cinnamon. I used to get it at our local grocery stores in the Albany NY area but neither Hannaford nor Price Chopper carry it. I ended up getting it through Amazon.com... VERY pricey but it is my favorite instant hot cereal and a great change off to have during the week. Not being an oatmeal lover because of the texture and blandness I was so happy to try this I eat it for breakfast and sometimes a snack I like the pecans and maple brown sugar is the only one I've tried. Tastes significantly better than instant oatmeal. Yes, it costs more. I like the Maple and Brown Sugar. Get it at Meijers.com. I'd love to know where people are finding this stuff for $2/box... it's $4.27 here and it never goes on sale. However, I love the flavor of the Maple Brown Sugar with Pecans! I like that is has a variety of grains, plenty of pecans and doesn't have that funky artificial taste. While it is only marginally better than oatmeal, it's been an easier step to eating healthy. One thing I would advise is make with milk and let sit a few minutes once out of the microwave, gives all the grains a chance to absorb some liquid and gets a better texture. I love it. I cant find it here anymore. I live in Maryland and have gone all over. Has anyone found a good substitute? I keep buying boxes of other brands, but they are too sweet and mushy. Hard to find and expensive. I bought 4 boxes today on sale at Safeway for $1.57 each. I had 4 $1.00 coupons so I only paid .57 for each box. I'll probably use it for muffin recipes or granola. I also ate one package of the maple brown sugar with pecans and added frozen sliced bananas. It was really good. I recently tried the vanilla almond and honey flavor because they were on clearance at a local discount store. I thought it was pretty good, but then again I love vanilla flavored foods and there really aren't many items out there that are too sweet for me. My only complaint would be the almonds. I'm not a big nut fan anyway and the crunchy texture was kind of odd in comparison to the smooth oatmeal. I probably wouldn't buy it again, but it's worth trying if you can find it on sale. I'd definitely like to try the apples with cinnamon kind though. The original version of this flavor is my favorite of the Quaker lineup. When these first came out I got all excited because they looked tasty and had no high fructose corn syrup, I bought a box on sale for 2.50 of the Vanilla Almond Honey flavor, I love almonds, but I didn't love this, it seem to have a really awful almost after taste, I don't know what it was, there was a Go Lean hot cereal that I tried that had the same flavor so maybe its some type of grain. But I love all the heart to heart kashi oatmeals, although I easily get sick of them, so maybe I might try the Apple cinnamon, but the almond was so gross I tried to force myself to eat it, even waiting like a week or a month before trying to eat it again, I just couldn't and ended up throwing it away. Add frozen blueberries to the maple flavored and you swear you are eating a cobbler! I have been eating the Almond vanilla flavor ever since it came out. I can't find it anywhere anymore. I am in process of contacting Quaker Oats to find out what happened. You can still get a $1 coupon on their website, so where's the product sold anymore. Help. I loved the vanilla one but now I can't find it anywhere. I tried the vanilla almond flavor today. It was ok, but way too sweet for my taste. I had a dollar off coupon, otherwise I would never had spent that much for such a small amount of instant oatmeal. Bottom line, I'm going to stick to my normal bowl of old fashioned oats and add my own small amount of stevia, raisins, walnuts & cinnamon. I tried the Maple Brown Sugar w/Pecans. I am not an oatmeal person but I loved this! I paid $2.50 on sale in the grocery store for the 6pack. My goal is to eat it every day for a month! I have tried other instants including Kashi and but this is by far the best for my taste. At Sam's club, I bought a variety pack (1 box each of each of the 3 flavors) for abotu $3.75 - only a few cents more than I paid for a single box at Walmart. I love this product! I bought a large box of the mixed variety at Sam's Club (which will definitely give you a better price than buying the single flavors at the grocery store). It is so much better tasting that the Quaker Instant Oatmeal Maple and Brown Sugar. I love the added nuts. The texture is so much better! You feel like you are eating real food! And the flavors are wonderful! (The only one that I didn't like very much was the Vanilla and Almond.) I was very happy to see this product on the shelves. I loved this oatmeal right off. My only complaint is that the portion sizes seem a bit small. The fact that I like it straight out of the package without adding other things to it makes it worthwhile to me even at these prices. I have been eating it every morning for 3 weeks. My 18 month old loves it too! While it is a bit more expensive than the standard instant oatmeal packets, the serving size is bigger and for me that makes it worth it. I've only tried the apple variety and quite liked it - even the larger apple bits. I'll try the vanilla/almond next because those are pretty much my two favourite flavors ever. I have tried the Apple flavor and prefer it to other instants I have sampled like Kashi. The apples are larger and I prefer that. I also add extra cinnamon for flavor and health benefits. I add some walnuts or pecans from my pantry too to give it more protein and some healthy fats to make it more filling. I wish they would package it in paper envelopes like kashi to make it more environmentally sound instead of the plastic. I agree it is quite pricey. I did find it on sale at Walmart one week and bought it. My 11 year old son thought it was great. I tried it this morning. It was OK. Though the price of $4.79 is a bit much. The only reason I bought it is because it has 12 grams of sugar per packet vs. 16 grams for the raisin & spice oatmeal that I normally buy. I figured 4 grams saved can't hurt. I'm not sure if I will buy it again.